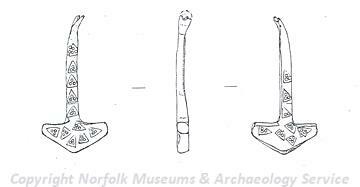 Metal detecting in 1994 recovered a Late Saxon decorated gold alloy Thor's hammer pendant. Thor's hammers, the symbol of the god Thor in Norse mythology, were worn as amulets by Vikings of pagan belief to invoke his protection. Gold alloy Thor's hammer, stamped on both sides with triangular stamps, each containing three pellets. The type fits well with other known examples from England, such as the silver examples from Sibton in Suffolk and Swithland in Leicestershire, and those from the Cuerdale and Goldsborough hoards. 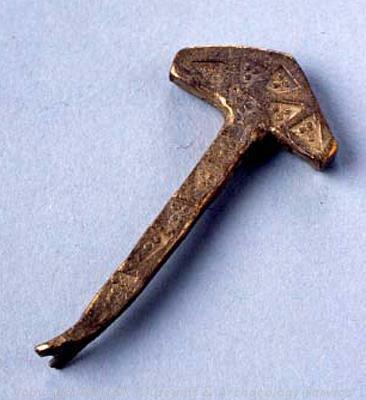 Thor's hammers, the symbol of the god Thor in Norse mythology, were worn as amulets by Vikings of pagan belief to invoke his protection. (S1), (S2) and details in file. W. Milligan (NCM), 19 December 1994.